In fact, the bigger surprise would have been if the Avalanche made a significant deal before the NHL trading deadline passed Monday afternoon. The Avalanche claimed defenseman Mark Alt, who has played nine NHL games, on waivers from Philadelphia and acquired D-man Ryan Graves from the Rangers for Chris Bigras, who had been with the San Antonio Rampage. Alt, the son of long-time former Kansas City Chiefs offensive tackle John Alt, will join the Avalanche and Graves will report to the Rampage. Also, Blake Comeau, the veteran winger pictured above whose contract is up after this season, stayed put. 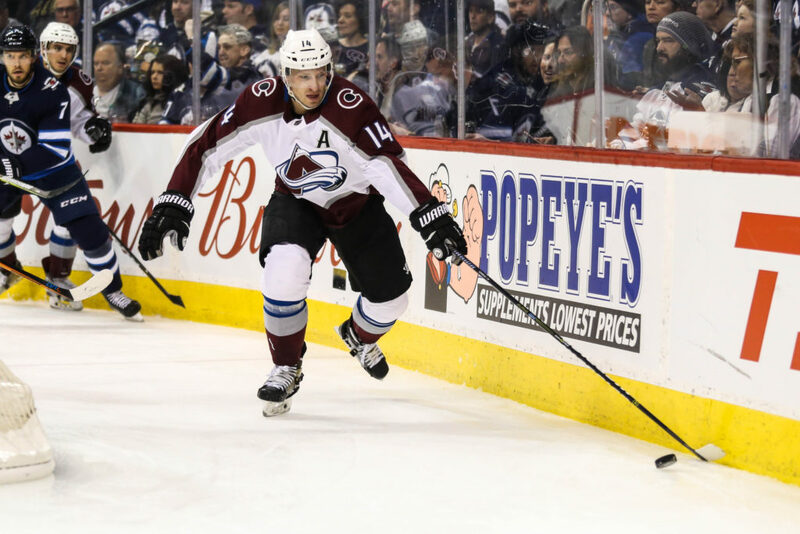 “It was pretty quiet,” Colorado general manager Joe Sakic said at his pre-game availability Monday night, shortly before the Avalanche beat Vancouver 3-1 at the Pepsi Center. “We knew it was going to be quiet, though. Not a lot going on. “We had a lot of conversations about different possibilities, but we weren’t in the rental market. We want to stay the course, this being a fun team to watch. We have a great group of kids, a great team with a lot of chemistry. Right now, we’re only four points out (of a playoff spot), and we have a couple of games in hand. All along, Sakic had made clear that aversion to acquiring a likely rental, even if that improved the Avalanche’s chances of making the playoffs. Those chances improved a bit Monday. At the end of the night, the Los Angeles Kings had 73 points and were precariously sitting in the second Western Conference wild-card spot, two points ahead of the 33-24-5 Avalanche. Calgary (73) and St. Louis (72) were between the Avs and Kings. In different situations as the deadline approached: a) the San Jose Sharks added Evander Kane, whose contract is expiring, from Buffalo; b) the Boston Bruins took on Rick Nash, whose deal is up, from the Rangers; and, c) the Winnipeg Jets acquired former Avs center and still-Denver resident Paul Stastny, whose four-year, $28-million contract with St. Louis — the one he signed after turning his back on the Avalanche — is coming to an end. In fact, the Avs previously had taken a shot on rentals during Sakic’s tenure, most notably in 2016 adding Shawn Matthias and Mikkel Boedker, who both departed as unrestricted free agents after Colorado failed to reach the postseason. The biggest name on the market, Ottawa defenseman Erik Karlsson, who has one more season remaining on his deal, remained with the Senators for now. Sakic wouldn’t address whether the Avalanche — currently minus injured defensemen Erik Johnson, Mark Barberio and Anton Lindholm — got in the bidding for Karlsson, who still is expected to be dealt in the offseason. “Had conversations with a lot of different GMs, a lot of different things,” Sakic said. That also might have included checking with the Rangers about veteran defenseman and captain Ryan McDonagh, who is under contract through 2018-19. McDonagh ended up going to Tampa Bay, along with J.T. Miller, for two picks and three players. I asked Sakic if the Feb. 18 injury to Johnson changed his outlook at all as the deadline neared. The Avs are playing it coy with Johnson’s injury and especially the prognosis (“out indefinitely”), but it’s crystal clear that his absence creates a major problem. I discussed that in my previous commentary, also opining that standing pat at the deadline was a reasonable and defensible strategy after checking around. The Avalanche recalled defensemen David Warsofsky and Duncan Siemens last week, and now Alt, who was the quarterback on a state high school championship team in Minnesota in 2009 and then played three seasons of hockey at the University of Minnesota, also will get a look. Comeau has played well this season on the Avalanche’s revitalized third line, but he is 32. I asked Sakic if, in line with the reboot, the Avalanche considered trading Comeau — who would have been a rental for someone else. It keeps coming back to that. At times, it might seem to some that this team is getting too much praise, considering the Avalanche still is only in sixth place in a seven-team division and in 11th in a 15-team conference. But considering the Avalanche had only 22 wins and 48 points last season, the major improvement is startling. And Sakic is committed to the roster that has pulled it off.